On July 6-9, parliamentarians from OSCE member states gathered together for the annual conference of its Parliamentary Assembly, which was held in Belgrade. Among several agenda items, some of them strictly dealing with the usual OSCE bureaucratic protocol, the human rights situation in countries of the former Soviet Union was featured prominently. Uta Zapf, OSCE PA’s Rapporteur on Belarus held a special briefing on the post-election crackdown in that country, where she invited Belarusian and Russian civil society activists. Kimmo Kiljunen, OSCE PA’s Representative on Central Asia, addressed the plenary session and later spoke at an NGO briefing about the results of the work the International Independent Commission for Inquiry into the interethnic violence which took place in southern Kyrgyzstan in June 2010. Joining him at the briefing were NGOs and an anti-torture activist who urged eradication of torture in the OSCE area. This was Kiljunen’s farewell appearance at the Assembly both as Chair of the Commission, which just finished its work, and as a member of the Finnish delegation, following his loss in Finland’s last parliamentary elections. Kiljunen prefaced his speech at the plenary by acknowledging the great emotional toll that his work as chair of the Commission took on him. He proceeded to express his doubts regarding the Kyrgyz government’s political will to deal with the aftermath of the tragedy in a balanced and fair way. As he noted, the overwhelming majority of destroyed homes and of casualties during the June 2010 events were ethnic Uzbeks. Ethnic Uzbeks continue to be underrepresented in Kyrgyzstan’s government. For as long as the Kyrgyz government continues to resist calls for a credible effort of interethnic reconciliation, the future of Kyrgyzstan will remain bleak, was Kiljunen’s pessimistic prognosis. As soon as the diplomat finished his speech, the Kyrgyz delegation went on offensive, challenging the credibility of the Commission and the validity of its findings. The delegation’s head, Kanatbek Isaev, characterized the commission’s report as “subjective,” going as far as to accuse its members of having a “pro-Uzbek” bias. A female member of the delegation became so emotional during her retort that she appeared to be screaming by the time she finished. Among her complaints: the suggestion proposed by outside experts to change the name of the country from the “Kyrgyz Republic” to “Republic of Kyrgyzstan,” in order to better reflect the country’s multi-ethnic character. Among several speakers who took the floor following the emotional outburst by the Kyrgyz delegation was Viola von Cramon-Taubadel, a member of the Green Party from the German delegation, who defended the Commission and its report and urged the Kyrgyz side to abide by its international commitments in protecting its ethnic minorities from discrimination. Ethnic discrimination, torture and other assaults on human rights in the OSCE area was the subject of a special NGO briefing which took place on the second day of the conference. The briefing was organized by a prominent local human rights group, the Helsinki Committee for Human Rights in Serbia. Joining Kimmo Kiljunen were Tony Lloyd, chairman of the Labor faction of the British Parliament and long-standing critic of the use of torture and other illegal interrogation techniques in the global war on terror; Judita Popovic, Vice President of the Serbian Parliament; Vitaly Ponomarev, Memorial Human Rights Center; and Petr Afanassenko, a torture victim and anti-torture activist who worked as a bodyguard for former Kazakh Prime Minister Akezhan Kazhegeldin. Originally from Kazakhstan and currently residing in Belgium, Afanassenko shared with the audience his personal story of enduring torture at the hands of the former high-level Kazakhstani official and former member of the Kazakh President’s family, Rakhat Aliyev. Echoing Tony Lloyd’s appeal for countries to abide by the principle of inadmissibility of evidence obtained under torture, Afanassenko told the audience about Mr. Aliyev’s efforts to discredit Kazhegeldin by forcing him to sign a self-incriminating confession under the influence of psychotropic drugs and various kinds of physical and psychological duress. Having filed a civil lawsuit against Aliyev in a Vienna court, Afanassenko claims to represent a group effort by individuals who were victims of Aliyev’s. Apart from his personal goal of obtaining damages for the loss of his career and health, Afanassenko hopes to send the following message to Aliyev and other torturers: “There is no place for you in democratic Europe.” Together with other human rights activists at the conference, Afanassenko delivered a letter addressed to the head of the delegation of Austria to the OSCE PA, Barbara Prammer, urging the Austrian government to order a thorough investigation into the criminal charges against Aliyev. A recent article in the leading Viennese newspaper, Wiener Zeitung, quoted members of the European Parliament expressing dismay with Austria’s failure to take action regarding the grave charges against Mr. Aliyev, including his alleged responsibility for the murder of two bank employees whose bodies have recently been found, after missing for several years. Participants in the briefing noted the irony of legitimate refugees from Central Asian countries facing obstacles in obtaining asylum in EU countries, while human rights abusers like Aliyev seem to be able to find safe haven using their unlimited wealth and influence. Vitaly Ponomarev finished the briefing by drawing attention to the plight of the 28 Muslim refugees who were recently extradited from Kazakhstan to Uzbekistan. 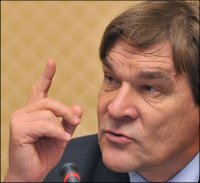 He urged the repeal of the 1992 Minsk Convention signed by members of the CIS, which contravenes the UN Committee against Torture and the internationally recognized principle of non-refoulement.